The holidays may be gone, but the Bad Season is just getting started! 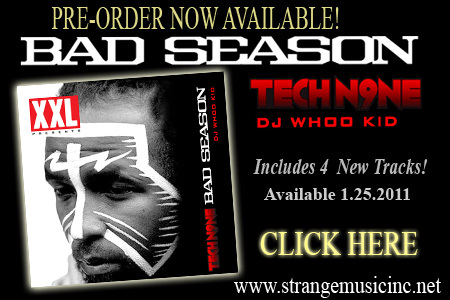 Strange Music and DJ Whoo Kid are proud to announce the release of the Bad Season mixtape. Here’s your chance to preorder your copy of this critically acclaimed mixtape! We are releasing a high-quality CD version with 4 new tracks for you to digest! Pre-order your copy today and make sure that regardless of what the weather’s like outside, you’re always in the middle of a Bad Season.